April 2015 n Performance & Hotrod Business n 45 sufficient for the task and that each pair of rod bolts will achieve equal loads. Bolt stretch is generated by a num- ber of factors, including tensile strength and mass, (the length of the bolt being stretched). The effective diameter of the bolt contributes to this. For example, let's consider two 3/8-by- 1-inch bolts. One features a 1-inch shank, with threads on the full 1 inch of the shank length. The other bolt features 3/4 inches of shank length that is full-diameter and smooth, and only 1/4-inch of thread length at the tip. The bolt with partial thread will stretch less, because the shank area between the head and nut engagement area has a thicker cross-section. The partial-thread bolt will have a 0.375-inch diameter shank, while the all-thread bolt will have only a 0.324- inch shank, (due to the smaller root diam- eter inside the thread path). ARP, to cite one example, calculates the stretch number for every bolt. On the spec sheet that is included with every bolt set, this stretch goal is listed, in addition to a torque value, but the torque value should be used as a guide only. ARP does not want the installer to use a torque value as the final indication of bolt stretch. Rather, the bolts should be individually measured for stretch, to assure that each bolt is installed at its optimum strength. 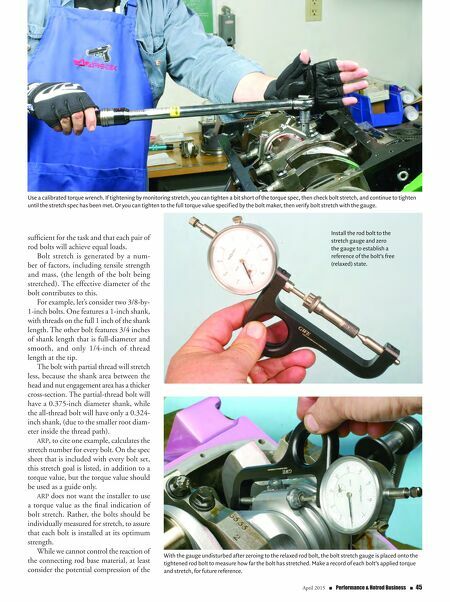 While we cannot control the reaction of the connecting rod base material, at least consider the potential compression of the Use a calibrated torque wrench. If tightening by monitoring stretch, you can tighten a bit short of the torque spec, then check bolt stretch, and continue to tighten until the stretch spec has been met. 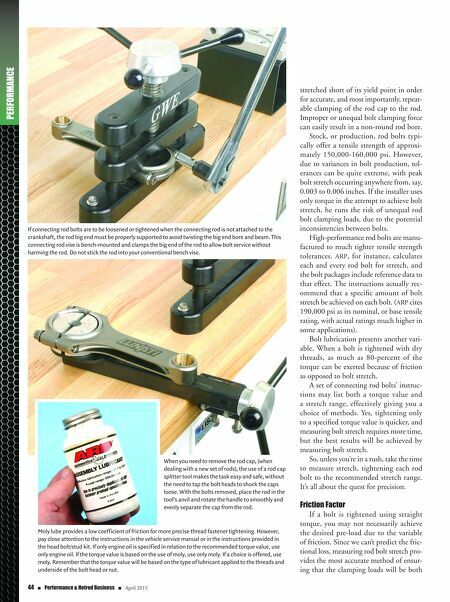 Or you can tighten to the full torque value specified by the bolt maker, then verify bolt stretch with the gauge. Install the rod bolt to the stretch gauge and zero the gauge to establish a reference of the bolt's free (relaxed) state. With the gauge undisturbed after zeroing to the relaxed rod bolt, the bolt stretch gauge is placed onto the tightened rod bolt to measure how far the bolt has stretched. Make a record of each bolt's applied torque and stretch, for future reference.